Yes, this is the same company that owns your local bowling alley. 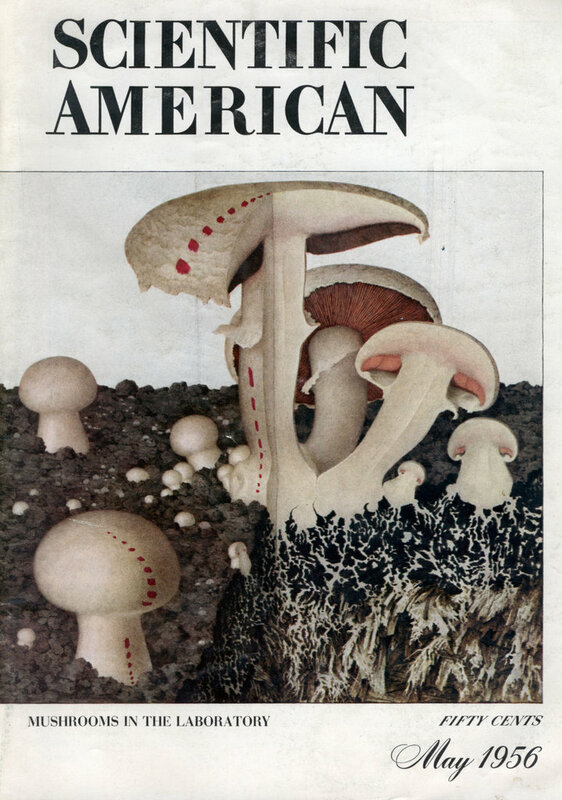 The mass-irradiation of foodstuffs for the prevention of spoilage and infestation is one of the most exciting and promising applications of atomic energy. 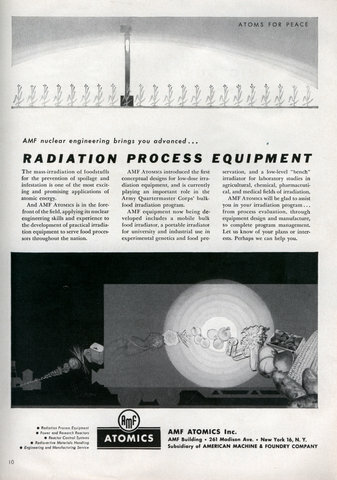 And AMF Atomics is in the forefront of the field, applying its nuclear engineering skills and experience to the development of practical irradiation equipment to serve food processors throughout the nation. 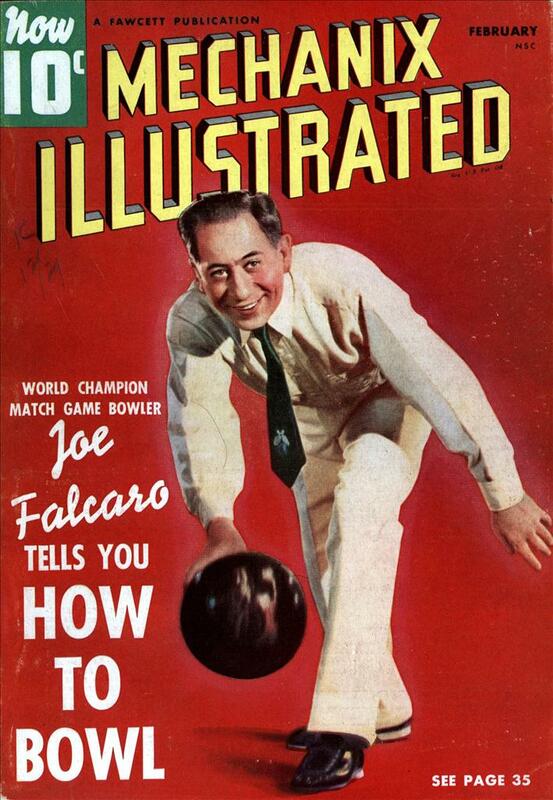 I HAVE, through personal instruction, made thousands of good bowlers from beginners. 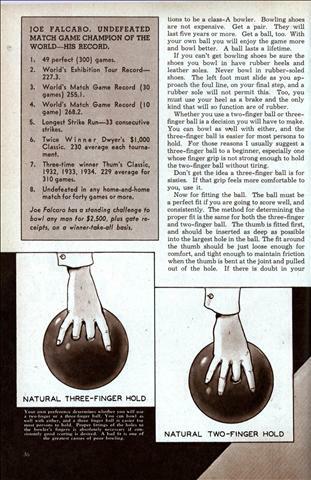 Too, I have made hundreds of excellent bowlers, men who average around 200, from good bowlers. 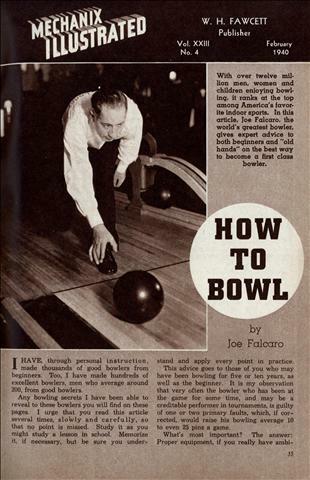 Any bowling secrets I have been able to reveal to these bowlers you will find on these pages. 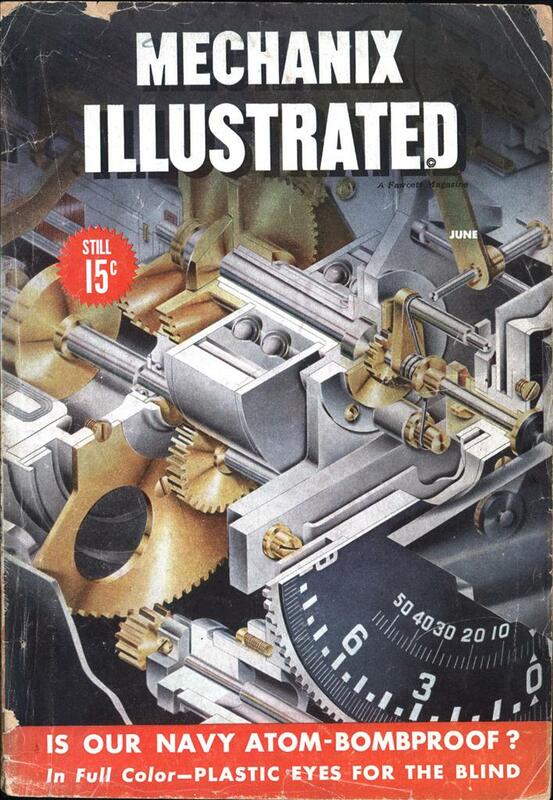 I urge that you read this article several times, slowly and carefully, so that no point is missed. Study it as you might study a lesson in school. Memorize it, if necessary, but be sure you under-stand and apply every point in practice. 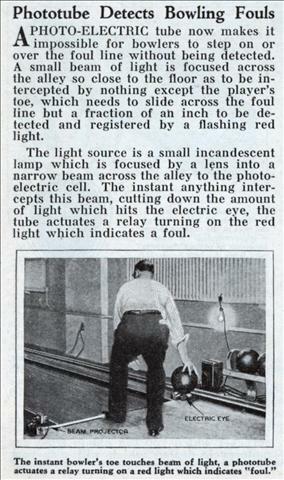 A PHOTO-ELECTRIC tube now makes it impossible for bowlers to step on or over the foul line without being detected. A small beam of light is focused across the alley so close to the floor as to be intercepted by nothing except the player’s toe, which needs to slide across the foul line but a fraction of an inch to be detected and registered by a flashing red light. No Arms yet he enjoys the sport of bowling and even hung up a score of 96 at duckpins on his very first try in a Washington, D. C, bowling alley. 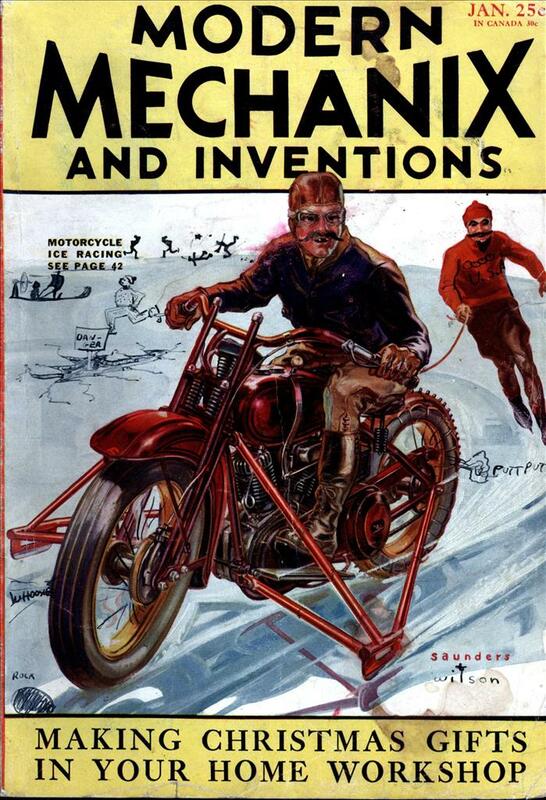 The ingenious device is the invention of Harold A. Carlson, 45, who lost both arms as a youth in a railroad accident. He is shown above all set to swing a duck ball down the lane for a strike. A rubber suction cup, attached to his arm prothesis, holds the ball. At the proper part of the swing, a trip device lets the ball go. 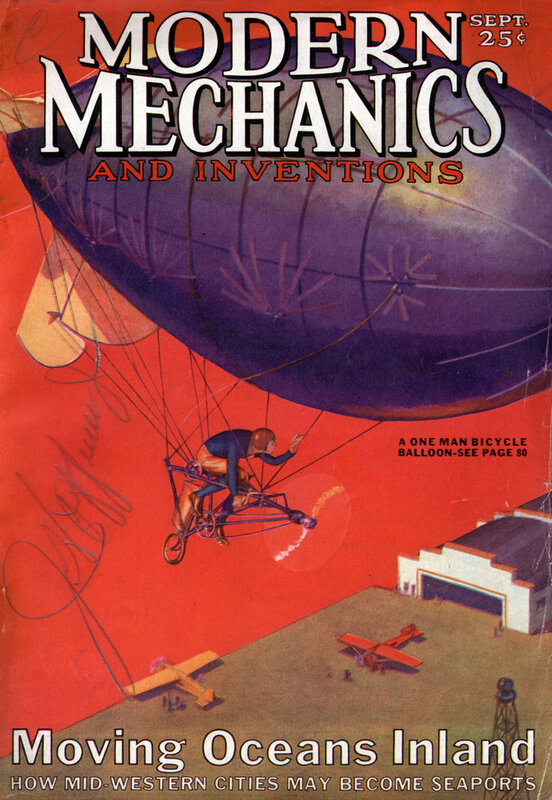 Carlson says that all parts for the invention were bought at variety and bicycle stores. A BOWLING alley with essentially no difference from a regulation type is in operation in Germany equipped with a machine that not only does the work of the ten-pin boy but also registers the count of the games and keeps the players’ scores separate. 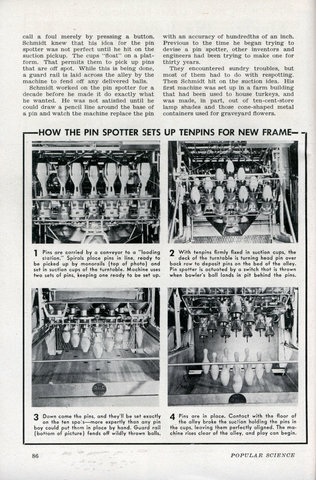 The machine is mounted under the ten-pin platform. It stands the pins up after they have been knocked down, returns the balls and tabulates the count by an illuminated indicator. It is electrically operated, and no further attention need be paid it after the current has been turned on. 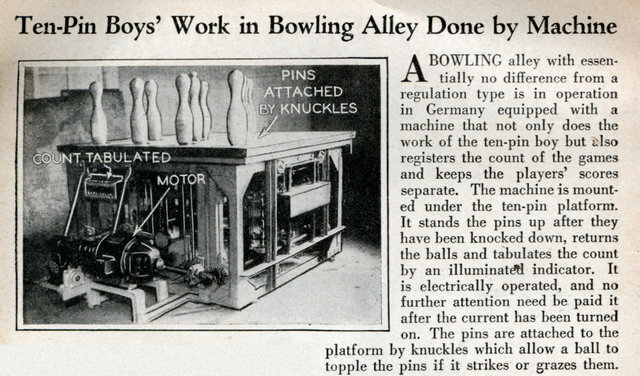 The pins are attached to the platform by knuckles which allow a ball to topple the pins if it strikes or grazes them. Posting is going to be light this weekend because I’m in San Francisco for Maker Faire. If you live in the bay area you should check it out. 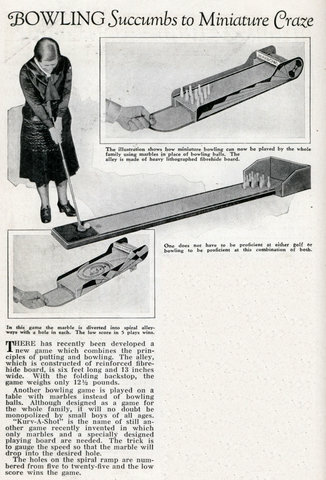 THERE has recently been developed a new game which combines the principles of putting and bowling. 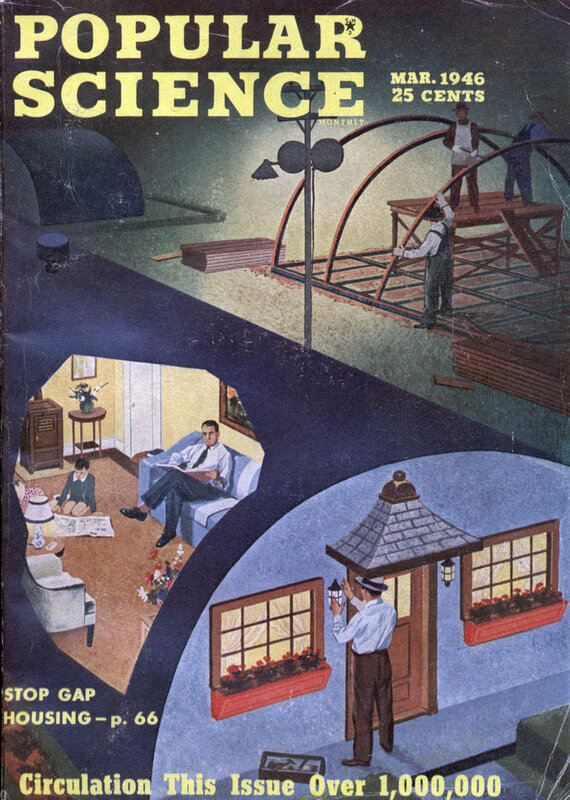 The alley, which is constructed of reinforced fibre-hide board, is six feet long and 13 inches wide. With the folding backstop, the game weighs only 12-1/2 pounds. Another bowling game is played on a table with marbles instead of bowling balls. 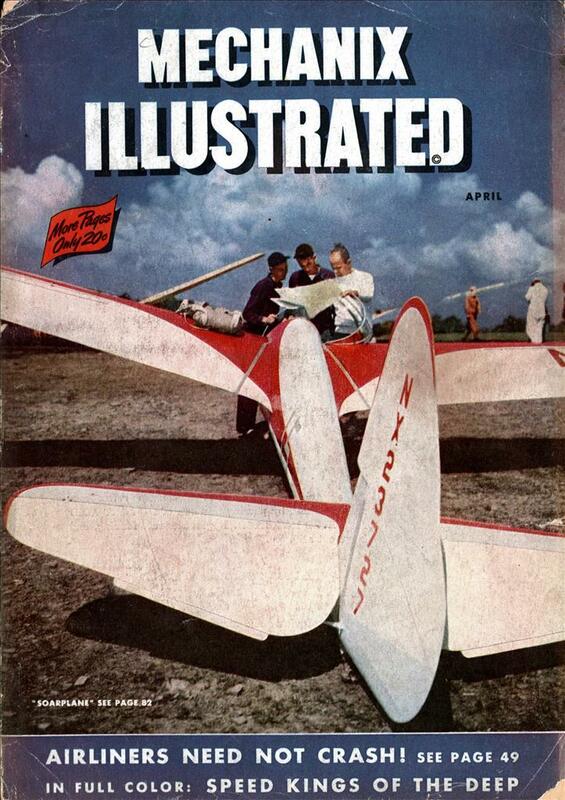 Although designed as a game for the whole family, it will no doubt be monopolized by small boys of all ages. “Kurv-A-Shot” is the name of still another game recently invented in which only marbles and a specially designed playing board are needed. The trick is to gauge the speed so that the marble will drop into the desired hole. The holes on the spiral ramp are numbered from five to twenty-five and the low score wins the game. 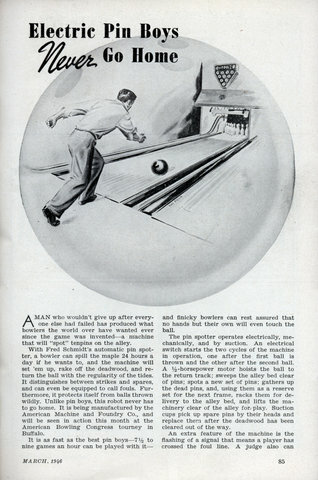 The electric-powered Whittle Rotobowler, below, flings an 18-lb. 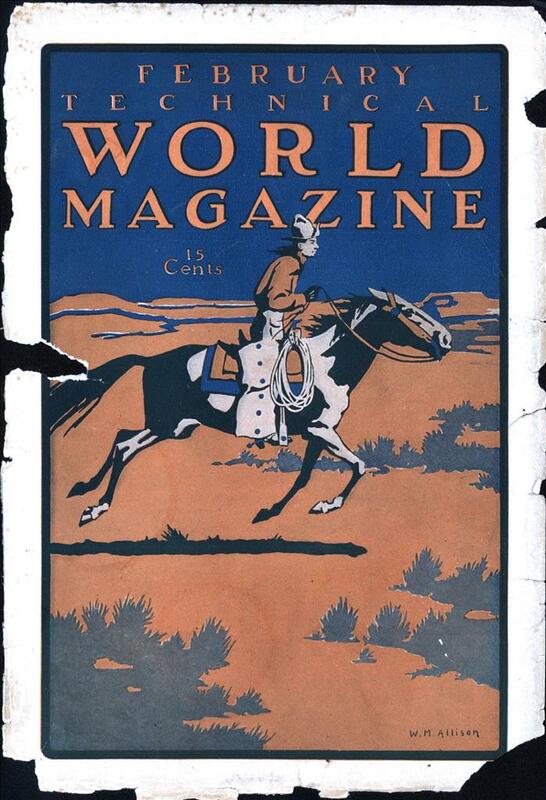 aluminum ball down a 94-foot carpeted court at speeds up to 100 m.p.h, in the latest variation of an old sport. 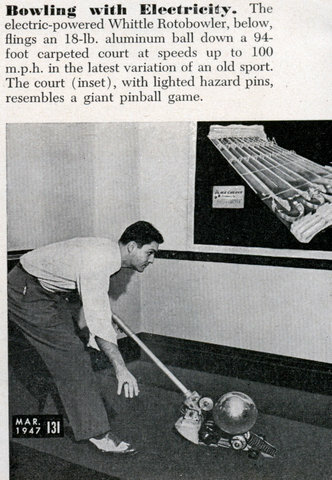 The court (inset), with lighted hazard pins, resembles a giant pinball game. 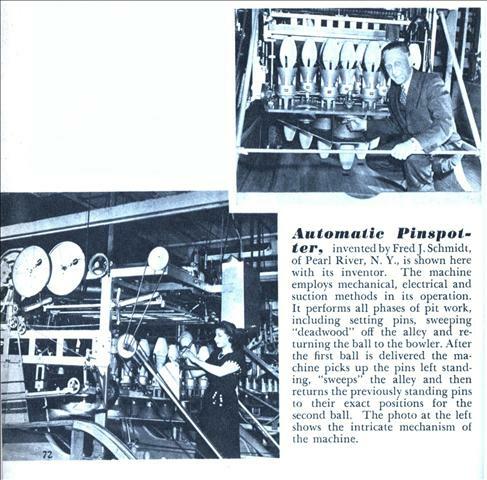 A MAN who wouldn’t give up after everyone else had failed has produced what bowlers the world over have wanted ever since the game was invented a machine that will “spot” tenpins on the alley.